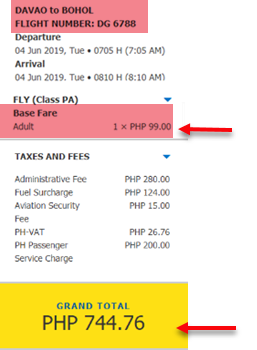 Get as low as P99 base fare via the new Cebu Pacific SNAP seat sale 2019! Start your life adventure, avail the low base fare promos of Cebu Pacific Air which feature sale tickets from Cebu Pacific hubs in Cagayan, Clark, Davao and Iloilo. 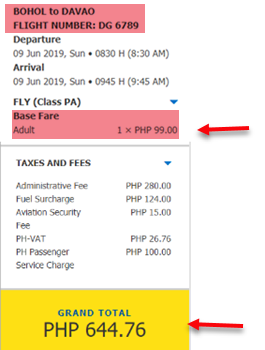 This new Cebu Pacific domestic promo fare tickets are great for flights on March, April, May, June, July 2019. Quoted promo fares are base fare rate only good for one-way flight. Inclusion is 7 kilos hand carry baggage and no checked baggage allowance. Web Admin Fee, taxes, Fuel Surcharge, Domestic Terminal Fee shall be added to the base fare to get the total fare. To prove that the promo is legit, we shared below Cebu Pacific promo tickets Davao to Bohol/ Bohol to Davao which we got via online booking. To get the sale tickets, you may book by booking online at www.cebupacificair.com where you may book without a promo code. This may be available at ticket offices or sale offices if you have luck. However, since this booking for the promo is only 1 day, the best option would be booking online. Need help in online booking? Read CEBU PACIFIC ONLINE BOOKING GUIDE. What are you waiting? Book your tickets fast! LIMITED promo fares on sale! 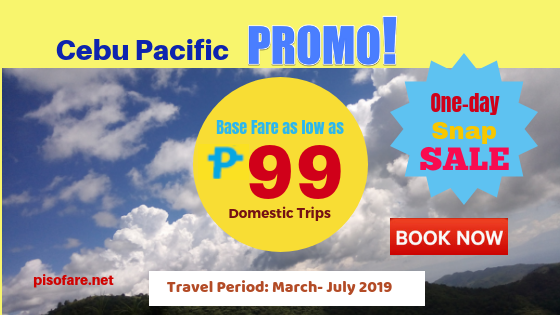 For more Cebu Pacific and other airlines promo fares and seat sale 2019- 2020, PISO FARE promos, travel tips and updates, do not forget to LIKE and FOLLOW our Facebook: PISO FARE TICKETS!! !